When we see our children suffer, whether it’s physical or, emotional, can be hugely triggering. As a mum of two young children, I recall I regularly felt overwhelmed and triggered in this way. This blog might trigger negative feelings or thoughts about ourselves, so before reading on please read first: Overwhelmed by guilt and shame while parenting? Congrats! This blog also explains how you can use the Awareness Mantra in case you get triggered by this blog. One of my children was a very unhappy easily upset child, not comfortable in her skin and expressed she wanted to die when she was six years old, she would say e.g. “Nobody loves me” and “I hate myself” and accused me and my husband of preferring our other child, which to be fair was much easier. I thought I should be able to lift her burden. I believed I should be able to make her feel good again. I worried I was terribly wrong and was damaging her for life. I didn’t dare to share any of my worries with other mums because I thought they would blame me, thinking I was not good enough, or I was making my child unhappy. I set myself up for further ‘failure’. We cannot change how others are feeling. But I blamed and shamed myself for her unhappiness, and developed unhelpful thoughts about myself, other people’s judgement of me, and my parenting ability. All those thoughts and feelings drained my energy level even further, leaving me with a shattered Baseline when I needed a reserve of energy the most. We would like to change how our child is feeling, experiencing or thinking to prevent them and ourselves from hurting. Unfortunately, we don’t have the power to change how others are feeling, experiencing or thinking. We can only be in charge of our own emotional reactions and model that power to our children. We the parents are the context of our children, if we don’t feel all right, that will affect our children. Our children can’t feel safe when we don’t feel safe. 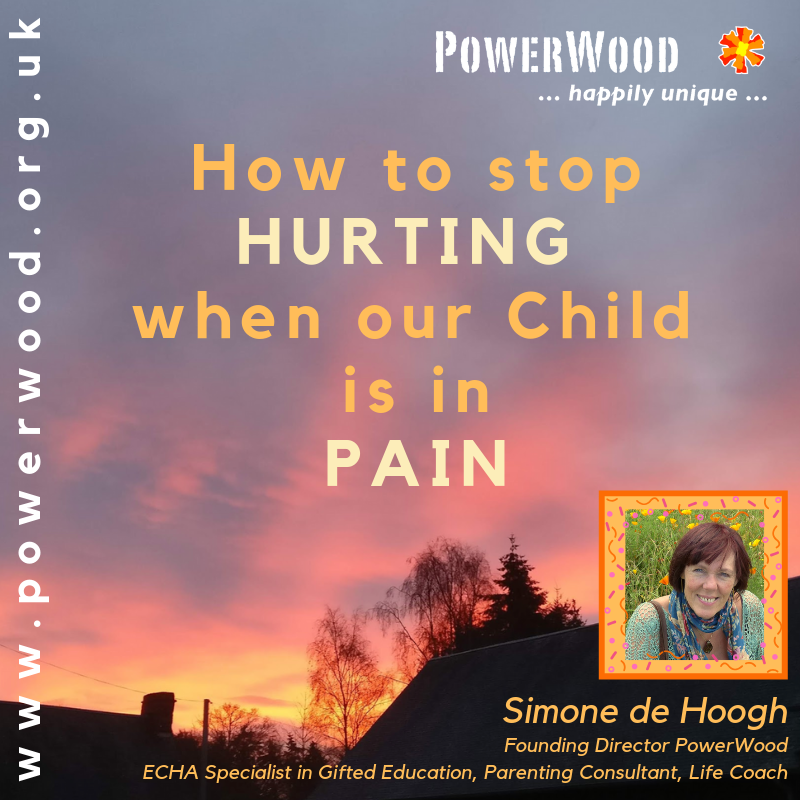 Our sensitive, intense and hyper-reactive children never react to what we tell them, our words, they react to how we feel and get triggered into an emotional block if we are emotionally involved/triggered. 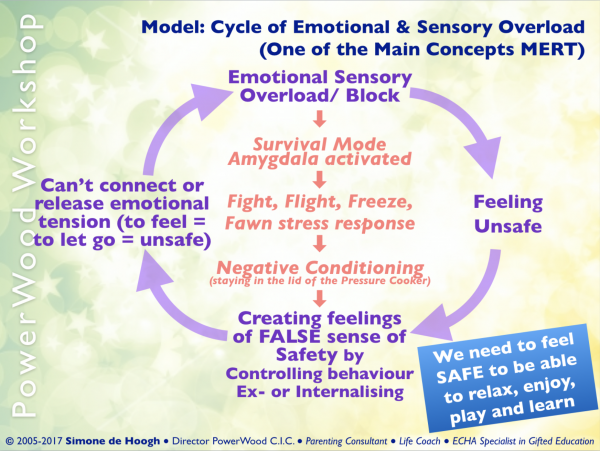 Consequently, our children will seek false safety in the Cycle of Emotional and Sensory Overload (MERT) by subconsciously trying to control how we are feeling or behaving and if we get affected by our child’s feelings or behaviour we provide that to them. When my child said “I hate myself” and ‘Nobody loves me” it was just an expression of how overwhelmed she felt. I took it literally and personally even though it didn’t say anything about me or my abilities, only how she felt. When our child is in pain and we are hurting because of it, we probably have a combination of Emotional OE, Thin Boundaries and the Fawn Stress Response, meaning that when stressed we will have the tendency to focus on other people’s needs. On top of that I was a mum of two young children and like many of us, exhausted. I never slept enough, was still adjusting to my new life and thus was probably in a stress response most of the time, as this new job – being a mum- that I had landed without any proper training, except on the job, was triggering feelings of inadequacy. I asked myself why would my child be unhappy? Or lonely? I felt nobody understood my everyday challenges – the feelings of worthlessness. Everyone can be a mum, why can’t I? When we are tired, worried, frustrated, stressed, etc. our own stress response is triggered, and before we know it we have entered the Cycle of Emotional and Sensory Overload. We create a false sense of safety so as to not feel overwhelmed. We can’t be of much support when we are in the Cycle. We all know that when we feel like this whatever we say to our child will not be heard because they will only react to how we feel: overwhelmed with a stress response. I lost my Emotional Independence. My Baseline was drained and I triggered my child further in the Cycle by providing a sense of false safety as I allowed her to define how I was feeling. Our aim is to not take whatever our children are saying, doing or feeling personal. We need to view their suffering as an expression of how they feel and stay Emotionally Independent (Main MERT concept), and not being emotionally affected by our child. Most of us are conditioned to prioritise others over ourselves, so it might feel counter-intuitive to prioritise ourselves, as we often feel safe when we can focus on others instead of ourselves. This personal journey will allow us to step back from the overwhelm and our automatic stress-responses and sit in the director’s chair of our lives YouTube Channels and plan our own and/or our families path forward. There are many Tools and strategies that we can use to strengthen our emotional resilience. Our emotional resilience and energy level together are our Baseline, so anything that is Baseline enhancing will help also with strengthening our emotional resilience. To be able to be Emotionally Independent we need a strong Baseline because that will give us the energy and emotional resilience required to stay calm whatever our children are feeling, saying or doing. Read my blog about Baseline enhancing: Top 3 Tips to Up your Baseline (Energy and Resilience Level). Focussing on ourselves sounds for many of us counterintuitive, as we feel safe when we focus on others, however that is often not by choice but a stress response and prioritising ourselves will prevent further exhaustion, allowing us to acknowledge our own needs and boundaries and fill our bucket and model to our children how to take good care of ourselves. When we focus on ourselves and strengthen our Baseline we can get in charge of our emotional reactions and keep them away from our encounters with our children, offering them emotional safety and helping them to open the Cycle of Emotional and Sensory Overload. Don’t let any not helpful train of thoughts drain your energy any further. Apply the Awareness Mantra: “I’m proud and grateful to be aware I have an unhelpful thought” and nourish yourself with the 4-7-8 breathing exercise.